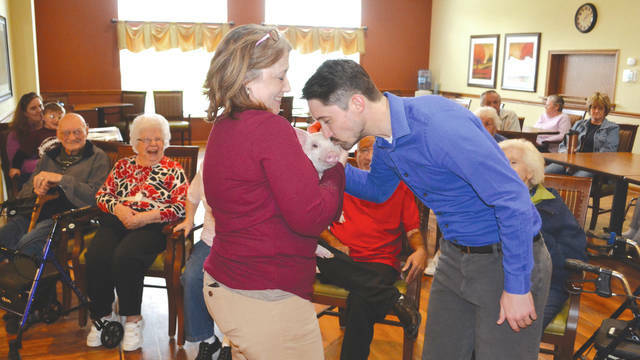 Urbana Place’s area sales specialist Zach Liggett kisses a pig Monday as his reward for raising the most money in his piggy bank for the facility’s fundraiser for muscular dystrophy research on Monday. Urbana Place raised $104. Life Enrichment Coordinator Shayla Smith holds the pig borrowed from Rynoka Farms. IH Credit Union donated the piggy banks. https://www.urbanacitizen.com/wp-content/uploads/sites/36/2018/04/web1_KissPig.jpgUrbana Place’s area sales specialist Zach Liggett kisses a pig Monday as his reward for raising the most money in his piggy bank for the facility’s fundraiser for muscular dystrophy research on Monday. Urbana Place raised $104. Life Enrichment Coordinator Shayla Smith holds the pig borrowed from Rynoka Farms. IH Credit Union donated the piggy banks.